This tour looks to fit in the must see highlights of the island in one day, mixing the best from the Moai Monuments Tour and the Historic Pathways Tour. Beginning at the seven statues of Ahu Akivi, the only restored inland group of moai, survey the history of the Rapanui people and the various theories on why they constructed the moai and how they transported them. From there, head to Anakena Beach and Ahu Nau Nau, the cradle of Rapanui civilization, where the royal family lived and the first Polynesian voyagers arrived. Soak up the sights at this palm-fringed golden sand beach and jewel amidst a coastline of jagged rocks before continuing to Ahu Tongariki, the largest line up of moai on the island. Fifteen colossal megaliths stare down from an incredible height, now restored to their former glory after having been overthrown by the islanders during the 18th century. Explore the volcano crater and stone quarry of Rano Raraku, the birth place of the statues, where about a thousand moai were fashioned and over three hundred still lay in various stages of carving. Towards the end of the day, drive the road along the rugged south coast before ascending up to the mile-wide volcano crater of Rano Kau - the most stunning natural wonder of the island. Enjoy the late afternoon light visiting the ceremonial village of Orongo, where once a year, certain warriors and chiefs from each of the island's clans would dwell for a month before a competion of epic proportions would take place, determining the island's next Birdman and ruler for the following year. Ahu Akivi - A restored site of seven moai, Ahu Akivi is said to represent the first seven explorers who came to Easter Island. 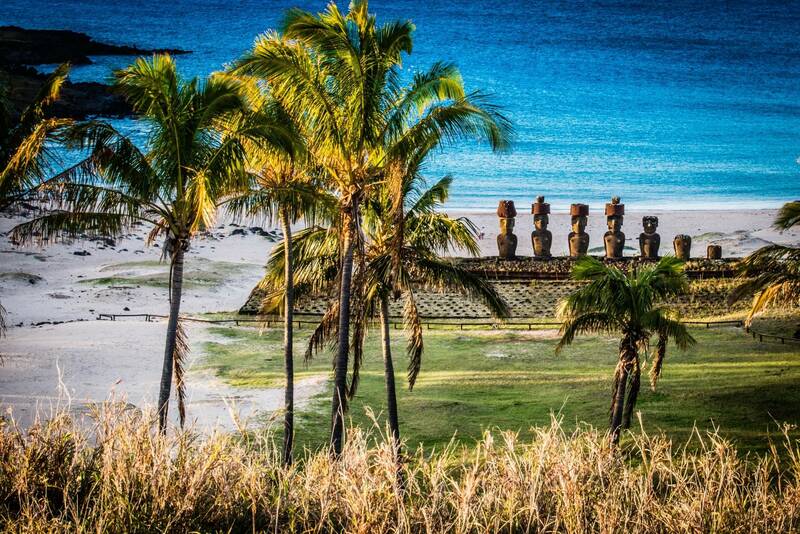 These moai are the only group of statues looking out to the sea. Anakena Beach/Ahu Nau Nau - Anakena beach belonged to the royal family in ancient times, and it is easy to see why. With its crystalline water, white sand, coconut palms and royal moai, it truly is one of a kind. Ahu Tongariki - Restored between 1992 and 1996, this is the most awe inspiring of the various platforms. Here, fifteen of the largest moai set their stone faces like flint, looking eternally toward the setting of the sun, as well and the comparatively insignificant tourists who come to pay them homage. Rano Raraku - This is the birthplace of the moai, a virtual quarry of statues. Here, hundreds of handsome heads and torsos sit in various stages of carving, still waiting to be transported to their various ahu located all over the island. Rano Kau – A large volcanic crater which plunges 200 meters below to a beautiful lake. With a great panoramic view of the island, it is probably the Easter Island's most magnificent natural wonder. Orongo – The ceremonial village, where during the 18th and 19th centuries, one of the most interesting political ceremonies happened once a year as different tribes competed to become the leader of the island. In a breath-taking sports event that involved climbing down cliffs, swimming out to the islets off the coast, the islanders came to this beautiful part of the island to see who would be their next ruler. Please note that we reserve the right to change the order of the sites visited depending on preference of the guests, weather and other factors.